When skin is not the same all over, it's hard to feed your needs. Nature's nutritionists provide precise portion control to be sure that skin "eats" smart. Wheat Protein and Soy Protein deliver lightweight liquid nourishment where needed to soften and soothe dry zones without weighing down T-zones. Konjac Powder soaks up sebum, and only sebum, and leaves no leftovers to shine a face up. Skin that's oily here, dry there feels fresher, smoother everywhere. Dermatologist and Ophthalmologist tested. Ingredients: Aqueous (water, aqua purificata, purified), infusions; lavandula angustifolia (lavender), matricaria chamomilla (chamomile), butylene glycol, octyl hydroxystearate, sesamum indicum (sesame) oil, caprylic/capric triglyceride, sucrose, oryza sativa (rice) bran oil, anthemus nobilis (chamomile), mentha spicata (spearmint), pelargonium graveolens (geranium), lavendula angustifolia (lavender), citrus bergamia (bergamot) essential oils (olea), coconut acid, butyrosepermum parkii (shea butter), amorphophallus konjac root powder, laminaris saccharina extract, retinyl (vitamin A) palmitate, triticum vulgare (wheat) germ extract, sodium hyaluronate, hydrolyzed soy protein, hordeum vulgar (barley) extract, pantethine, acetyl glucosamine, tocopheryl (vitamin E) linoleate , linoleic acid, centella asiatica (hydrocotyl) extract, hydrolyzed wheat protein, squalane, glycine soya (soybean) stearol, caffeine. 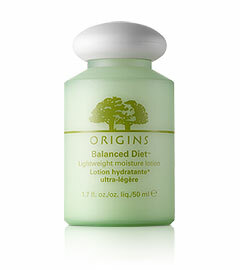 I have used Origin’s Balance Diet Lightweight Moisture Lotion as my daytime moisturizer for over a year. After researching the product, I decided to purchase the moisturizer because of the claims that it works best for combination skin. I was looking for a light moisturizer for the summer months that would not feel heavy or look greasy under my liquid foundation. Moreover, my goal was to find a moisturizer that would not break my skin out nor feel heavy in the Arizona summer months and Balanced Diet does accomplish that. The moisturizer is lightweight and absorbs quickly into my skin, it has a milky watery texture, and it has a very light minty scent, a perfect texture and weight to wear under foundation. Although, I purchased the moisturizer to use during the summer months, I also use it during the winter months as well. Does the product perform the way the company claims? To a certain extent, yes it is lightweight and does moisturize the skin. In concerns, with controlling your oily areas, I will say my forehead doesn’t get as oily as it did before I started to use the product. My biggest concern is that Balance Diet did not break my skin out. That alone (for me) is worth sticking with the product. Will I purchase again, yes. In my opinion, the moisturizer is pricey. However, the fact that I have not experience any breakouts and it doesn’t feel heavy and greasy during the summer months makes it worth the price.